"The classrooms that produce high achieving students are those in which students work on deep, rich mathematics through tasks that they can take to any level they want. No one is told what level they can reach and no one is held back by narrow questions that limit students' mathematical development and creativity." The above quote comes from a recent article by Stanford professor Jo Boaler. Professor Boaler, through her Youcubed organization, advocates for valuing depth and creative problem-solving over computational speed and memorization in K-12 math education. She further argues that classroom emphasis on the latter is partly to blame for the poor understanding and dislike of math in the US and the unfortunate belief by some students that they are not "math people." How did the US get to a place where so many people think that math achievement is indicated by a limited and limiting set of skills? Would you really measure achievement in literature or composition by how well and quickly a student spells and punctuates? Of course not! Language arts subjects are accepted as a form of art with all of the associated depth, creativity, and multifaceted approaches to thinking. Although genuine mathematics shares these characteristics, for decades school math has typically skimmed the surface of math knowledge, allowed little room for creative thinking, and focused on the "right" way to get the answer. While math assignments are constructed and graded rather narrowly, language arts assignments are regularly assessed for creativity and style in addition to technical proficiency. But did you know that professional mathematicians also place a high value on creativity and style when it comes to reviewing each other’s work? Clever and elegant proofs are admired far more because they unveil and illuminate the inherent beauty in mathematics in ways that technically correct but unwieldy proofs cannot. At the K-12 level, an educator skilled in mathematical thinking can teach even the youngest students the kind of rich mathematics that inspires creative problem-solving and a genuine love of learning. It is these skills, not computational speed and memorization, that will better prepare students for success in the modern world. Everyone is a "math person" at IMACS! 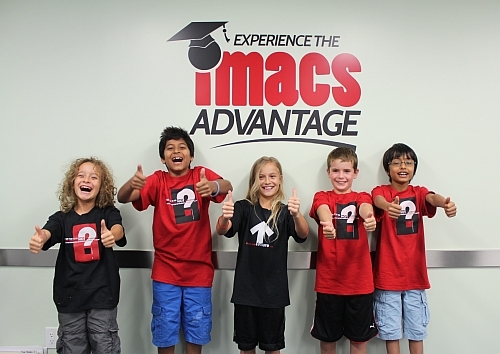 Enroll today in our awesome Hi-Tech Summer Camp, or register to attend a FREE Placement Class! Like IMACS on Facebook for the latest information about our local classes and online courses.